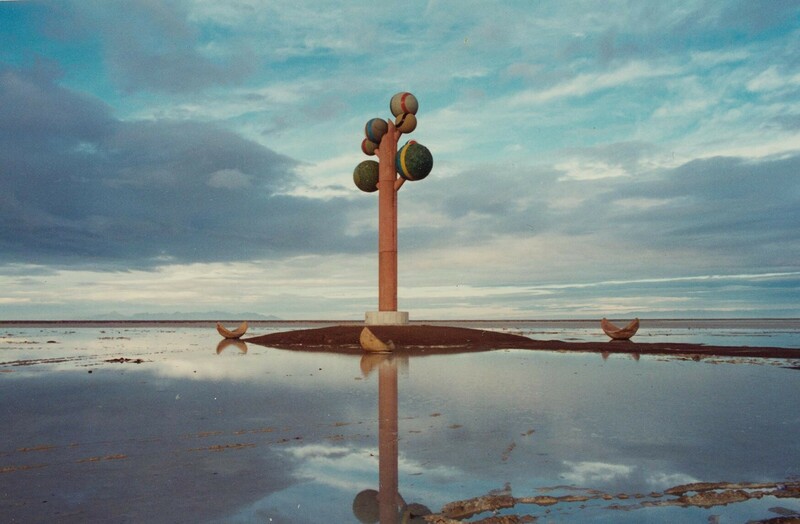 The Tree of Utah is an artwork constructed between 1982-1986 by the Swedish artist Karl Momen. The Iranian-born Momen, who painted portraits of Stalin and the Shah of Iran early in his career, later studied with the surrealist painter Max Ernst, and studied architecture at the Kunst Academy in Stuttgart, Germany. It has been said that he was moved to create the 87 foot tall tree by the "vastness and relative emptiness" of the Bonneville Salt Flats, and that the tree "brings space, nature, myth and technology together". The tree's six spheres are all coated with natural rock and minerals found within the state of Utah, and the pods below symbolize the changing of the seasons, when trees naturally transform themselves. The costs of building the tree, reportedly over a million dollars, were provided entirely by Mr. Momen. The tree now belongs to the State of Utah.